Drawing on decades of experience of loudspeaker design starting in the 1970s when he worked for the BBC, Derek Hughes designed the Stirling Broadcast AB-2 Bass Extender to seamlessly integrate with all versions of the legendry LS3/5A including both the classic 15 ohm and 11 ohm. When used with the Stirling Broadcast BBC licensed LS3/5A V2 (shown in the photograph above) it makes an exceptional musical partnership. To achieve this, Derek’s new design has used a new high quality crossover and a cabinet with a larger internal volume cabinet than the original AB-1. The Stirling AB-2 is 48mm taller and the plinth is larger, measuring 25mm x 255mm x 235mm (HxWxD) making the AB-2 a stable platform on which to sit the LS3/5A. 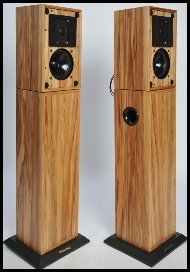 The AB-2 is available in a wide choice of veneer options, please check with your dealer. The AB-2 is sold with our standard 5 year warranty on the drive units and crossovers. The Product Brochure for the AB-2 can be found here and the Installation and Care Instructions can be found here. All brochures and instructions can be found here.